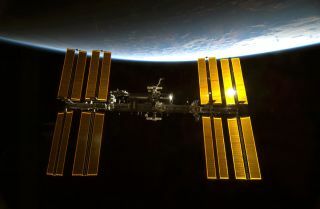 Two pieces of space junk whizzed by the International Space Station this week but posed no threat to the orbiting laboratory or its three-person crew, NASA officials say. The space debris —a chunk of an old Russian Cosmos satellite and leftover chunk of an Indian rocket —made back-to-back flybys of the space station Thursday and Friday (Sept. 27 and 28). The Russian Cosmos satellite debris made its closest approach to the space station on Thursday at 10:42 a.m. EDT (1442 GMT), with the Indian rocket remnant making its close pass Friday at 1:47 a.m. EDT (0547 GMT). Initially, NASA and its Russian partners planned to move the space station clear of the incoming debris by firing the rocket thrusters on a European cargo ship. But more observations of the orbital debris found the space junk fragments would not creep too close for comfort when they zoomed by, NASA officials said. NASA and its partners typically move the space station if there is a high probability of space junk passing inside a safety perimeter shaped like a pizza box that extends around the orbiting lap. This red zone extends about a half-mile (0.75 kilometers) above and below the station, and about 15 miles (25 km) around the football-field size space lab. Planning for the possibility of a space junk avoidance maneuver forced space station controllers to delay the undocking of the European cargo ship that would have performed the move. The departure of the European Space Agency's Automated Transfer Vehicle 3 (ATV-3) was originally scheduled for Tuesday (Sept. 25), but failed to undock due to a computer glitch that has since been resolved. The ATV-3 spacecraft, which is named Edoardo Almadi to honor the late Italian physicist of the same name, is now scheduled to undock on Friday afternoon at 5:46 p.m. EDT (2146 GMT), NASA officials said. Space junk has been a growing threat for astronauts on the International Space Station and satellites in orbit. The U.S. military's Space Surveillance Network and NASA regularly track about 20,000 pieces of space debris orbiting the Earth.